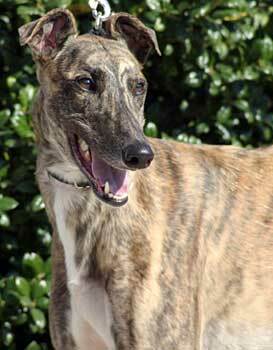 Cabot is an 18-month-old dark brindle male born May 2, 2006. His sire is Dodgem By Design, making his grand sire the late, famous Gable Dodge, and his dam is Whirlwind Badge. Obviously he was expected to follow in his sire's footsteps, but that was not to be. 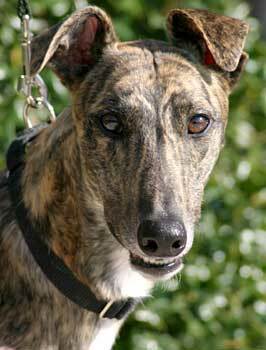 On the morning of November 5, 2007, his future as a racer was cancelled, as Cabot suffered a fracture of his central tarsal bone on his right rear leg when he collided with another greyhound during schooling trials at Valley Race Park in Harlingen. Wizard suffered a similar, but worse fracture, in a totally separate incident at about the same time. Cabot and Wizard were flown to Addison Airport by "guardian angels" Jane and Michael Scott. He was immediately taken to Dr. Jeff Ellis of VCA Preston Park Animal Hospital who x-rayed and evaluated Cabot, then referred him to Dr. Fulton Reaugh at Dallas Veterinary Surgical Center. Surgery was performed on November 8, 2007, placing two screws to stabilize Cabot's central tarsal bone. Cabot has now been officially released and is ready to find his forever home! The broken hock is healed and will not impede Cabot's life as a companion pet. From Cabot's cat test: Cabot was interested in the cat, but not THAT interested. He looked and moved in for the sniff, then got distracted with the new surroundings. This behavior remained consistent during his visit. Cabot got a good sniff of the cat's backside, but that ended abruptly when Dom whirled around to face him. Cabot wanted nothing to do with that face-to-face encounter. He got to observe the other dogs of the house ignoring the cat, too. Cabot is considered cat trainable and also lives happily in his foster home with a Pug, so he will probably do well with other small dogs. Cabot is an absolute pleasure. I have been smitten with him right from the start. He is intelligent, charming, and even a little bit silly at times. I simply adore his gentle and endearing personality. Cabot gets along perfectly with my little Pug -- in fact she has fallen in love with him a little, too. Usually she is on the couch with me but now that Cabot has joined us she curls up next to him on his dog bed. He is such a handsome boy, with beautiful brown eyes with even a little hint of a smile when he sleeps. Cabot walks very well on a leash though he tends to be a little shy when other people are around. It takes him a few moments to warm up to you but when he does he is every bit the gentleman. Cabot is housetrained and crate trained. Of course, there may be a little retraining when he goes to his forever home. The only accident he had was completely my fault. Poor guy needed to go out and was trying to tell me but I was trying to sleep in. Now I know that Cabot will tell me when he needs to potty. Oops! He has no qualms about going in his crate when it is time. He eases in there without an argument. He sleeps on his dog bed next to my bed at night and he wakes me up each morning with a little kiss and rapidly wagging tail. Cabot would make a wonderful companion. We will be very sad to see him go but will be excited for him to find his forever home.